Nosara was the second place along our Costa Rica Escape. The town is a little bit sleepier than Santa Teresa, but don’t think it lacks anything in charm. It’s a real “locals only” type place where you can set into all the bohemian, hippie, magical vibes that the residents are putting down. 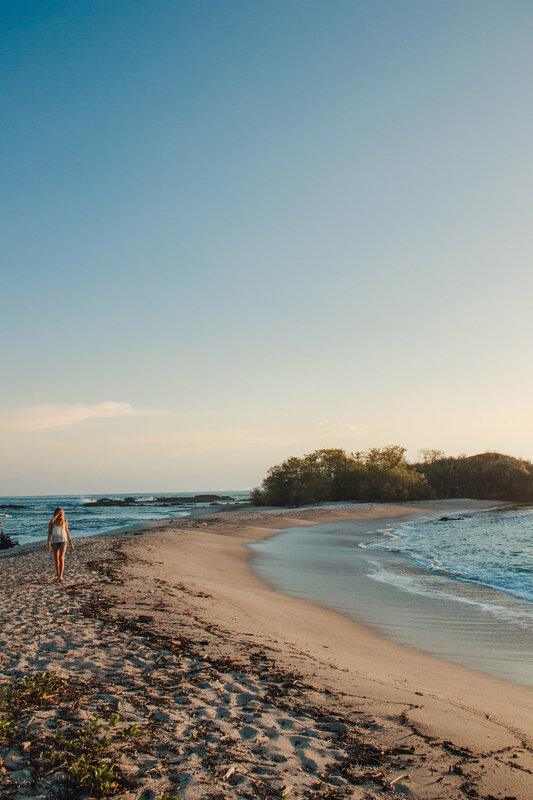 Don’t get us wrong, there’s a lot to do here, but you won’t feel all the hustle and bustle of a more touristic destination such as Tamarindo. Insider’s tip: in order to prevent dusting on the roads (because most are dirt or gravel) they spread a molasses which can have a pretty strong smell. This can make it quite unpleasant to walk for a long time if your sensitive to the smell so we would highly recommend a car if your thinking of staying here. As Nosara was the second leg of our Costa Rica Journey we drove from Santa Teresa. Although it looks close on a map and there is a shorter drive along the coast (2-3 hour), we recommed going the inland 5 hour journey. Depending on the season the coastal road is often pretty unsafe do to flooding and is often blocked off. Our advice - don’t risk it (because if you have to end up turning around, it will be even longer and you’ll still have to take the inland path anyways). · Bodhi Tree - We weren’t able to stay here, but did have the chance to do a yoga class there one morning which was lovely (they have a lot of different options from yin to ashtanga to vinyasa flow). It’s a great retreat center for yoga or other wellness practices too. They serve up all organic vegetarian fare, with plunge pools and enchanting wind-chimes to set the vibes. · Harmony - Another great retreat center, this one more centrally located. Again you can take local classes here or spend the day here for a small fee. Great spot for couples or families with a lot of space for privacy with that plush pampered feel. · Guilded Iguana - This was our favorite option hotel with an indie surfer feel. Newly renovated with a great pool space and plenty of outdoor lounge spots. Rooms have that all white Scandinavian feel paired with surfer and island tropics. It’s close to the beach so perfect if you plan to catch a sunrise surf sesh. · La Luna – Chic beachy vibes, a place to see and be seen. This is the best spot if you want to a sunset dinner by the beach. No other restaurant has quite the view La Luna has. · Robin’s Cafe – If your looking for a casual lunch spot in town, with all the delicious healthy eats you can think of, check out Robin’s cafe. We actually ate here twice in our 3 day stay because it was just that tasty. Try their raw vegan wrap - it’s to die for. · Pacifico Azul – Perfect spot for a romantic dinner. Food is incredibly fresh and beautifully plated. Beautiful hanging lights and soft melodies in the background with more private tables arranged in the back. You may want to consider making a reservation earlier in the day if you plan to go at prime time during peak season. · La Negra – A little bit of a drive outside of town (definitely can only go here by car) but a fabulous little spot for dinner. Fresh local foods and candle lit tables make this an enchanting little spot for the night. · Harmony Cafe/Juice Bar – As we said before, this is a great centrally located place to hang out. They serve a light and fresh breakfast in their cafe, with a juice bar you can hang out at during the day. They have wifi and lounges if you wanted to take a break for a few hours and relax. Maybe even check out on of their yoga sessions while your there! · Surf – Playa Guiones is probably the most accessible and has a pretty consistent beach break lefts. Walkable from the main town center of Nosara. Though, if it’s dry season and you have 4WD, there are some secret spots up and down the coast to check out as well. · Saturday farmers market – though it’s a small town they do have a local market Saturday morning were they sell all kind of organic foods, lotions, and crafts. · Sunset at San Juanillo Beach – What’s better than one beach? Two beaches of course! A really picturesque spot with a double beach (Shown in the images below) and perfect for watching the sun go down. Bring a picnic or some drinks and have a romantic moment. We spent our second day here and watched the sunset over both bays. · Organic Fare – lean into the organic food scene that is Nosara. They have a lot of healthy options and ways to experience fresh local cuisines and produce. Also a lot of their clothing is organic or sustainably made to. Embrace it and enjoy all the boho goodness. · Exploring neighboring beaches – Don’t spend all your time at just one beach when you can catch a few. The San Juanillo is not to be missed, and there are a lot of other fun coves to explore. Get out there, and be adventurous. · Spend the day at one of the local resorts – Even if you don’t stay at one of their retreat centers, spend the morning or afternoon there! Get in all those zen vibes for a few hours and enjoy all the luxurious places to lounge and take in a good book, or pop into their wellness classes. So go get lost in all that bohemian dreaminess that is Nosara. Any more questions? Leave us a note and we’d love to help!